Only a wealthy man could lament, as Len Riggio did yesterday that “the average paperback costs two and a half times the minimum wage. When I started,” he said “it was one half the minimum wage.” Speaking at the opening of Book Expo in New York Riggio said that the high prices of books is impeding a new generation of readers. When someone who is prominent in an industry makes what sounds like a fact-based claim purportedly pointing to a serious structural problem, it too easily enters an industry’s mythology. There are so many things wrong with what Riggio is saying, but I want to focus just on the misinformation implicit in comparing book prices and the minimum wage. Data from the Federal Reserve Bank of St. Louis (FRED) (above), a trustworthy source, makes it clear that, using 1998 as a baseline (earliest data available), “recreational” book prices are 2.5% lower today than they were back then, and 14% lower than at their peak in the late 2000s. 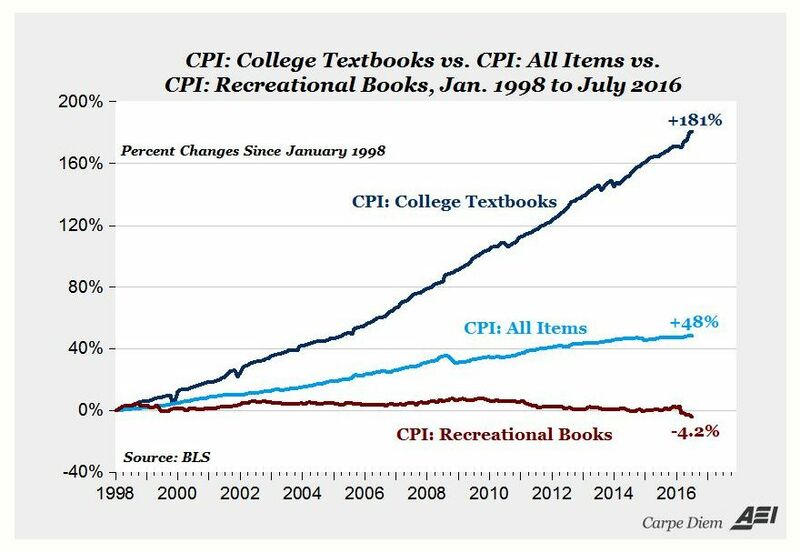 The overall Consumer Price Index (CPI) rose by 48% in the same period: recreational books kept getting cheaper in relation to many other things that we purchase. Len Riggio “began his bookselling career while attending New York University in the early 1960s.” In 1963 the actual stated minimum wage was $1.25. The one source I found tracking historic book prices lists the hardcover average price that year at $6.55. Even if paperbacks were a quarter of that price they would have been more expensive than the minimum wage. In 2017 mass-market paperback prices average $9.24 at retail, just 27% above the minimum wage (and roughly a third of average hardcover prices). 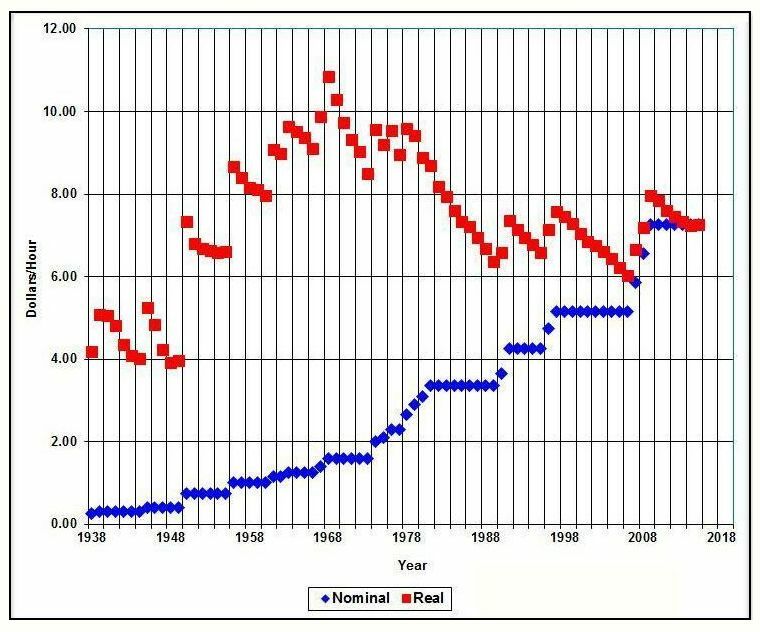 The chart below, from a minimum wage study, illustrates that the real minimum wage (in current dollars) is at levels last seen in the 1950s. 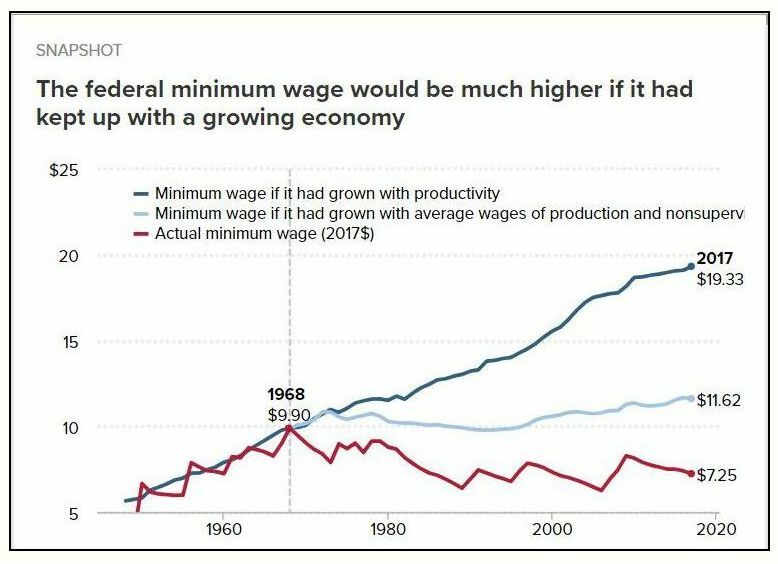 A chart from the Economic Policy Institute (below) demonstrates that if the minimum wage had grown at the same rate as labor productivity it would be over $19 today. If the minimum wage had grown merely as fast as the average wage of a typical U.S. worker, it would be $11.62 today. Pew research shows that the minimum wage will keep a family of four roughly 33% below the poverty level. And, by published accounts, the minimum wage is where you start when you accept a job at Barnes & Noble. Comparing book prices to a depressed economic marker is not useful. Regardless, book prices are lower today than they were twenty years ago, not higher. Riggio’s remarks are way off base. Len Riggio, meanwhile, made an appearance last week in the Wall Street Journal. The article, “The Hamptons Oasis That Barnes & Noble Built,” (paywall) describes Riggio’s front lawn. I don’t know what yours look like, but on Riggio’s modern art “masterpieces are dotted across the lawn,” including a 180-ton Richard Serra sculpture, part of “two dozen outdoor pieces spread over 13 lush acres.” There is no mention of the retail prices of books.